The Budhanilkantha Temple, dedicated to the Hindu god Vishnu, is located at the base of the Shivapuri Hills, approximately 10 kilometres from the centre of Kathmandu. It is believed that the deity was carved in the seventh or eighth century during the Licchavi period. It is the largest Vishnu statue in Nepal. The statue is carved from a single block of black basalt stone. 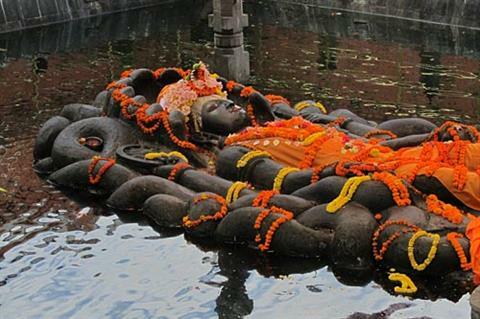 The Budhanilkantha statue is 5 meters in length and it lies in a reclining position inside a recessed tank of water. The tank represents the cosmic sea and is 13 meters in length. Known by many names like Sleeping Vishnu, Jalakshayan Narayan, the statue depicts the deity reclining on the twisting coils of the cosmic serpent Shesha . Vishnu’s legs are crossed and the eleven heads of Shesha cradle his head. Vishnu’s four hands hold a chakra or disc (representing the mind), a conch-shell (the four elements), a lotus flower (the moving universe) and the club (primeval knowledge).